Petrol is still the favoured fuel of UK buyers and it’s easy to understand why. Thanks to modern turbocharged engines, a small petrol can now deliver strong economy and good performance. Some of them also sound rather wonderful. So, here’s our pick of the petrol pops for 2017. 2017 is shaping up to be the year of the small hatch and the new Micra promises to be the best of the bunch. It more than lays to rest the dirge that was its predecessor and comes with either a 73PS 1.0-litre or 90PS turbocharged 0.9-litre petrol engine. 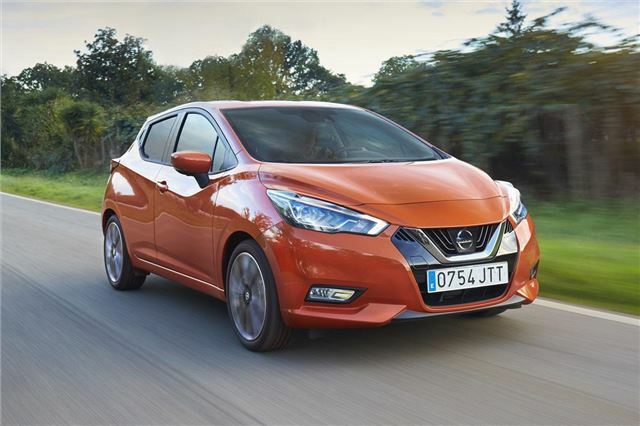 Our drive in this latest Micra tells us the 0.9-litre unit is the one to go for and that it makes the most of the car’s superb handling balance. Comfort is also good, while running costs of 64.2mpg and 99g/km mean the Micra will be cheap to run too. I'm not sure small capacity turbo engines are the way to go - too many give good fuel economy results in 'lab conditions' but are very thirsty when driven on actual roads. I would imagine the higher operating temperatures and pressures of turbo-engine cars will lead to more reliability problems too over time. So it's a shame manufacturers can't follow the example of cars like the light-weight Suzuki Vitara - the 1.6 normally aspirated engine in that car is good for 50 mpg in the real world despite the lack of a turbo. Also, its emissions are painfully close to the 30 quid a year road tax bracket too (until April 1st "politician's April fools day" of course, after which manufacturers will give up on improving emissions as there will be no incentive for customers to buy them, outside of having an environmentally aware conscience). Small capacity turbo petrol is the way to go until petrol-hybrids gets better range from the electric element. I recently had a Fiesta Ecoboost on hire for a weekend and the performance was outstanding (wheel-spin everywhere!!) as was the economy. Diesel has had it, ever since the UN declared it a carcinogen, and the Govt under Blair went the wrong way with the promotion and incentives to buy diesel. You also get DPF and DMF issues later in life if you don't drive them over long distances, as well as a shagged CAT. I'm shortly getting an 03 reg SAAB 9-5 estate 2 litre turbo with only 24K on the clock from a friend who's mother sadly has an illness and can no longer drive. My local SAAB specialist said it'll be bomb-proof and will go forever. In fact, weren't SAAB the first company to produce turbo-charged petrol engines in their 900 range years ago? Funny how what goes around, comes around!